Jumping a little around from the planned films up-coming, I couldn’t resist making this short about our Tiger Safari in Bandhavgarh. We saw 9 tigers in 4 safari’s, including one making a kill and one that got very very close indeed (Cesca admitted to being scared it might attack since we were in a totally open jeep on meters away!). Our time at the Tiger’s Den resort was wonderful. Only slightly marred by my getting food poisoning again (Mild this time). The safari’s were organised two each day and each jeep had a driver and naturalist on board. The quality of these posts was mixed to say the least, but we did have some excellent guides. The morning safari was managed very tightly and we had to follow a certain path through the park. This made a morning discovery of a tiger all the more private and the kill we saw was just for us. Evening safari are a free for all and the tigers were tracked and basically surrounded by jeeps. Cesca remarked that such dangerous activity would not be allowed in Africa, but then TII (This Is India). 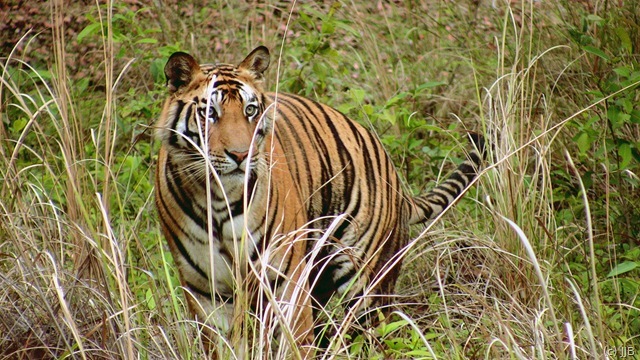 The tigers themselves are totally wild and allowed to roam as will. They are not tagged nor fed by the park and the Rangers were very tough on people breaking the rules. One of our jeeps struggled to make it back out of the park in time and raced us to the gate; the punishment? Up to a weeks ban, which would seriously affect the drivers income. All in all I like the park and thought it quite well run, I felt the tigers were very happy and basically ignored the humans in their white steel elephants! As well as tigers, we saw all kinds of wonderful animals including boar, jackals, deer and monkeys. We also saw some amazing Indian Rollers, which are one the most beautiful birds I have ever encountered. Here is the first of our pictures, taken (of all things) by my camcorder! I had a lot of fun making this film. The first two clips of music music are, of course, from one of my favourite movies of all time: Predator, which seemed appropriate for the theme. The sound effects and quotes are from same. If you haven’t seen the movie, it is a famously bloody jungle action film staring Arnie the Governator. The big guy and his team of ultimate badasses are being hunted in the jungle by an alien predator who picks them off one by one. Even if you are not a fan of gory movies, this one is worth catching on TV as the on-air version is well cut to remove the more bloody parts. Anyway, the film spawned a million quotes and most of my friends would be able to rattle off the entire script without trying!